“Can I love the world? I like it an awful lot, but do I love it?” The voice of a loud, high-pitched man rises above the din at Winning’s Coffee Shop on Harvard, near UNM, in Albuquerque. Rustling shoes creak on the old hardwood floors. The voices of various conversations merge with the whoosh of the espresso machine and tinkle of silverware on china. Some vaguely esoteric background music is barely discernible. Outside, at a table on the brick walkway, sits a young student dressed in black beret and worn brown flight jacket, smoking cigarettes and reading a hardcover book. A rust-colored pigeon pecks scraps of debris off the brickwork at the young man’s feet. To my left is the corner counter where Bradley is again selling his books. Today they are stacked in neat piles along the floor and countertop. “I just returned from a trip to Phoenix,” informs Bradley. “Non-fiction is on the top.” The books are packed in produce and wine boxes. Riverside Star grapefruit. Rancho Del Sol lemons. Almaden Mountain Burgundy table wine. Franzia: America’s Best Selling Wine. The guy behind the counter brings my plate, after asking a few other patrons first. “I forgot to write down your description,” he apologizes, setting the plate down in front of me. It’s a funny system, I think, where you order at the counter and they have to remember what you looked like to find where you’re seated. The personal touch of a college-district coffee shop. More personable than being assigned a number, like at the Frontier Restaurant a block up Central, but perhaps less efficient. A middle-aged man hunches over a laptop at the adjacent table. “Healthy in Paranoid Times” reads the sticker affixed to the back of the screen. My plate of eggs, bacon and hash browns is finished, sitting now on the far corner of the table like a lover scorned after the heat of passion. Outside at the smoking tables a young woman in red jacket, red-framed sunglasses and blue hoodie applies hand cream, wildly gesturing in circular arcs through the clear air while in seeming deep conversation with a fellow patron. “Are you ready?” shouts the high-pitched man, across the room from the guy with the laptop. He steps outside for a smoke, leaving his laptop on the table inside, its screen partially folded down like an abandoned seat at a sports stadium. The loud guys slips outside, humming a tune under his breath. They stand talking together in the cool morning air. 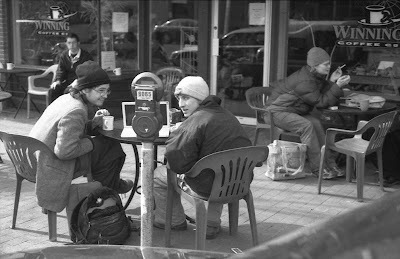 A young man, sporting a knit hemp cap, metal-studded belt and green T-shirt with the message “I Carry No Cash” is haggling with Bradley over a paperback. “I’ll hold it for you, if needed,” says Bradley. At my table, adjacent to the empty plate whose fork sits pointing toward the exit, next to the empty coffee cup, is a stack of two copies of Ayn Rand’s “Atlas Shrugged.” I’ve picked up one for a friend, the other for myself. Outside at the curb the parking meter is ticking down the minutes, while across the street the parking enforcement officer is slowly trawling the block for fresh victims. I gather up my things and head to the door. I’ve put extra coins in the meter, my small gift to some student in need of a warm cup of café culture. Today I was scanning and reviewing images from a roll of 35 millimeter silver gelatin film that I had exposed in a manual camera, and hand processed at home. It is a satisfying pursuit, one fraught with limitless opportunities to mess up. Even under the best of circumstances there are blemishes, flaws and other reminders that perfection of this antiquated art remains illusive. As a so-called ‘street photographer’ – a documenter of the public urban venue – I remain in some limbic state of suppressed development, as my personality, like that of my Dad, and his Dad before him, seems to avoid confrontation at all cost. This is evident in the sporadic and ill-timed quality of my forays into the hunt for the anonymous public persona. What interests me is how the qualities of the finished image are affected less by technical considerations of focus, composition and exposure and more by the social interactions between the photographer and the subject. Even these terms are deserving of additional scrutiny, given the uncertainty involved in the process. Take the term ‘subject’, for example. Does the juxtaposition of a human figure in an urban setting imply that the theme suggested by the image is man in his built environment? Is he really the subject of the street photograph? Indeed, is it not equally likely that man is inseparable from the built environment, built and builder being one; that by populating an urban setting the human presence serves the purpose of a prop, or structure; a compositional element within a larger context? Likewise, the role of ‘photographer’ is also deserving of further consideration. 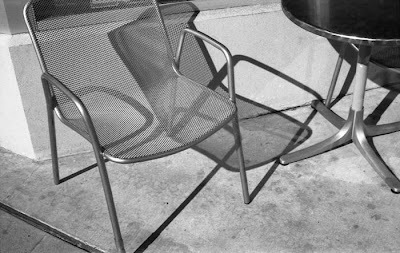 As I stand on a public sidewalk or curbside, camera in hand, and consider potential compositional possibilities, am I positioned as a detached, objective outside observer, or does my presence within the subjective environment imply a more ethereal motivation? Does the presence of the observer change the nature of the subject under observation, or does the subject itself induce a change in the observer? Rather than considering a successful outcome to be an image captured from the viewpoint of detached objectivity, perhaps my inner motivations are to document the place where I, as photographer, fit within the larger context. That by pursuing street photography I am actually attempting to capture a self-portrait, mirrored not in a sheet of glass but rather by the role others play as proxy for myself. These alternatives to the conventional dichotomy between photographer and subject, hunter and hunted, serve to challenge the preconceptions we assume about the objectivity of image making. Rather than images being mapped in a one-to-one correspondence with objective reality, the photograph functions more as an icon, into which are injected the subjective desires of the viewer. More as acted-out thought experiment than some actual performance art, I would propose the fashioning of a faux photographic device, whose external physical attributes resemble what is commonly assumed to be a handheld camera, but is in fact only a mere block of wood, carved and sanded, painted and decorated, so as to serve the function of proxy camera, a ‘fauxtography’ of sorts. The experiment would involve simulation of the process of street photography, specifically the public confrontation between fauxtographer and subject, not for the purpose of creating actual photographic images, but rather for the purposes of observing the aesthetics of the unfolding process itself. It is the gesture and response between fauxtographer and subject, the bringing of the faux camera up to one’s face in a position of mock confrontation, and the resulting response by the intended subject, that is of interest. I have long suspected that public encounters with anonymous photographic subjects have intrinsic connotations far afield from the mechanics and aesthetics of the photographic image. Making a spontaneous photographic record of a stranger’s public visage violates a commonly understood convention assumed to exist when two people meet in passing on the street. It is considered acceptable to offer a nod and a quick glance perhaps, but the sudden making of a permanent record violates the desire to remain anonymous. Our ‘real’ self – that invisible part of us underneath our corporeal shell – desires to remain private, hidden, unseen. Upon the snapping of the shutter it is as if an image of the inner self has been made, a portion of the sacred profaned. What motivates a photographer to need to go out onto the street and risk these unpredictable encounters has less to do with the desire to fulfill some photographic creative urge, I believe, and more to do with how the resulting image serves to function as an icon for manifesting a basic human need for intimacy and empathy. As much as it has been argued that man’s technology has severed the ties of social intimacy enjoyed by earlier cultures, it is ironic that one would be found to be using that most technological of creative tools, the camera, to reach back into the primordial past for a taste of the ancient ways. Cameras don’t record reality as much as they create icons out of the stuff of everyday life, into which we pour, like empty vessels, the artifacts of our dreams and desires.